Trump Backers Want Ideology Test For Extreme Vetting : Parallels What could "extreme vetting" mean in practice? For some who've helped form President Trump's refugee policies, it's not about stricter security screening. It's about something else. 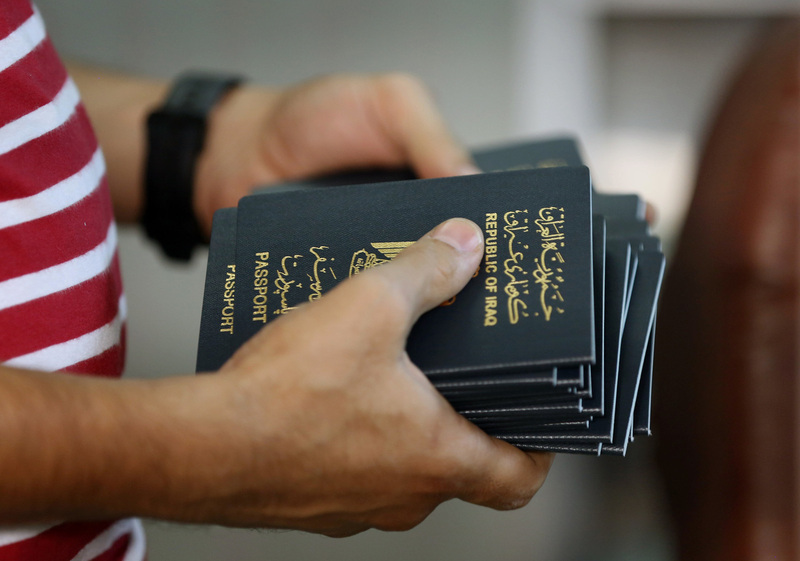 An employee delivers new passports at the main Baghdad Passport office in the Iraqi capital in 2015. But some of those who helped form President Trump's policies on refugees are upfront in saying this is not actually about stricter security screening. It's about something else. "It means a kind of ideological screening to keep out people who hate a free society even if they are not violent," says Mark Krikorian, executive director of the Center for Immigration Studies, a Washington think tank that supports tighter controls on immigration. Krikorian met with Trump during the campaign and backs the president's executive order as a "corrective" to the vetting system in place during the Obama years. President Trump signed an executive order suspending the State Department's refugee assistance program for 120 days until "extreme" vetting can be put in place. In an interview with NPR, Krikorian said he backs an ideological test that poses questions for refugees in the vetting process including, in his words, "Do you think it's okay to kill apostates? Do you think it's okay to throw gays off of buildings? Or if Islam's Prophet Muhammad is insulted, there should be a punishment?" If a refugee says yes to any of these questions, says Krikorian, "Then we don't want you here." Trump's executive order on immigration appears to refer to these views by declaring the United States should keep out those with "hostile attitudes toward it and its founding principles" and "those who would place violent ideologies over American law." This is all of intense concern for refugee advocates. The most pressing refugee need today is among Syrians — some 5 million have fled the country's civil war. The vast majority are Muslim. "It's clearly Muslim-targeted," says Muna Jondy, a Michigan immigration lawyer of Syrian descent who's been fielding frantic calls from refugee families in the U.S. whose relatives are now barred from joining them. She points out the refugee screening process already targets those with extreme Islamist views via counter-terrorism vetting, which checks for links to radical Islamist groups. But the president appears to echo opinions of a web of supporters who have warned about the wider "dangers" of Islam and more recently have called for rigorous ideological vetting. His national security adviser, retired Lt. Gen. Michael Flynn, has called fear of Islam "rational" and equates Islam with a political ideology. One of the most outspoken of these supporters is Frank Gaffney, founder and president of the Center for Policy Studies and a leading anti-immigration advocate. Human rights groups have described Gaffney as a conspiracy theorist and Islamophobe, but his views have gained traction in the Trump administration. Trump cited his work during his campaign. In recent interview with NPR, Gaffney laid out his view that Islam is a national security threat not only because of violent jihadists, but because of what he sees as "this stealthy, subversive kind of jihad" practiced by groups such as the Muslim Brotherhood. Gaffney claims the Brotherhood's stealth aim is to impose sharia, or Islamic law, in the U.S.
Gaffney supports an ideological test for refugees to "ensure they are not creating this sharia agenda, that they are not going to part of the Muslim Brotherhood or part of the networks that engage in radicalization." In a broad sense, tests of attitudes aren't unprecedented. Doris Meissner, a former commissioner of the Immigration and Naturalization Service, notes that an ideological test for newcomers is "deeply embedded" in U.S. history. The U.S. barred anarchists in 1903. During the Cold War, she says, "It was people who believed in communism. It's still in our law." But Meissner points out these ideological tests have not had the desired outcome, because over time, the tests "have proven to be poorly equipped to actually predict what people are going to do." And it gets more complex when the beliefs straddle the line between politics and religion. Meissner compares Trump supporters' fear of sharia law and their view that it's at odds with the U.S. system with the fears and debates surrounding the candidacy of John F. Kennedy in the early 1960s. Kennedy was Catholic and his detractors feared that if elected, the American president would be taking orders from the Pope. "Then, JFK made his well-known statement about his personal faith and his responsibility to the civil system," Meissner says. For Muslim activists, the idea of a test targeting their beliefs is alarming. Wilfredo A. Ruiz, a Muslim convert and spokesman for the Council on American Islamic Relations, an advocacy group, says invasive and subjective questioning about religious beliefs already takes place at airports by border patrol agents. "The questions are now more specific," he says. "Are you Sunni or Shiite? Are you acquainted with Wahhabism? Do you have a Quran in your luggage?" Ruiz says he's filed dozens of complaints in the past few weeks with the Department of Homeland Security for what he calls intrusive questioning of Muslim travelers. His clients often comply, he says, handing over their passwords to cell phones and social media because refusing would result in a long wait and missed flights. "People need to know this is going on," he says, noting that civil liberties groups are working together, sending squads of lawyers to airports in support of passengers detained for questioning. "They no longer see it as a Muslim cause," he says. "Jews, Hispanics, African-Americans — everyone is asking, who's next?"